30 year lease with options, acquire the leasehold interest in land in the name of the foreigner. This can be done via a registered 30 year lease (residential) to the foreigner in the foreigner’s own name with pre-paid options to contractually renew for a further two periods of 30 years each. The foreigner may also be given the option to purchase the land should the law in respect of foreigner’s land ownership rights change. Under Thai law, the foreigner can own the structure (for example a house) erected on the land. In order to be enforceable, any lease for a period of longer than three years must be registered, which involves payment of a registration fee and stamp duty based on a percentage of the rental fee for the whole lease term. The original registered lease remains in force and effect even if the property is sold. 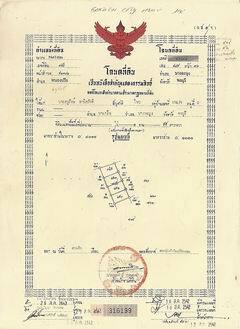 Thai law requires that 51% of the shares be held by Thai juristic persons, however, any company with more than 40% foreign interest that purchases land may be investigated by the Central Land Office in Bangkok (under Section 74 of the Land Code) to ensure that the company has not been organized in an attempt to circumvent the prohibition against foreign ownership of land. This results in the foreign ownership of the company being limited at 39%, but with the recommended changes to the Articles of Association, the foreigner can be the only director of the company, and the only officer of the company who can commit or bind the company in any contractual dealings - effectively giving the minority shareholder control over the company. The company is required to submit an annual balance sheet once per year, and there will be a tax obligation, however the costs are minimal and your lawyer will have an accounting department able to assist you with the above. What is a Thor Tor Sam (3)? 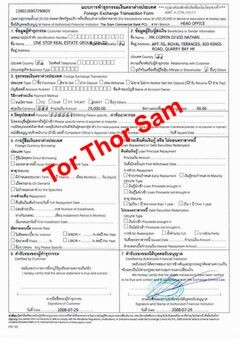 A Thor Tor Sam (3) is an official bank document issued by the receiving bank upon the receipt of foreign currency into your bank account in Thailand. You must request a Thor Tor Sam from your bank when you are remitting funds to Thailand for the purpose of purchasing a condominium, and the Thor Tor Sam must specify that the remittance is solely for the purpose of purchasing a property - Code 5.22. For areas which are not surveyed, there are other documents for land possession such as evidence of the possession of the right to utilize the land or other interests in the land. 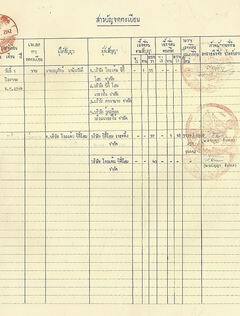 These documents are called "Nor Sor Sam (3) and Nor Sor Sam (3) Kor". Unlike the Title Deeds, these Nor Sor documents are issued to show the possessors' exploitation of the land. Though these documents do not provide ownership rights, as do Title deeds, they can still be registered for transfer of the lands for which they are issued. Can I obtain a mortgage loan? It is common for a real estate developer to arrange for his customers to have a financing package from a financial institution. In most real estate development projects, a down payment can be made in installments from 10 to 24 months.